Yes, it’s our Season 3 finale. We’re off to go and drink beer scour Australia for more exciting dog stories for next season! The Dogs vs cats: the great pet showdown story was in the December 2009 issue of NewScientist magazine. It’s available to view online for subscribers only. Need supplies for your dog? Visit our sponsor, Mega Pet Warehouse. Time to get some stuff for your dog? Please support our sponsor, Mega Pet Warehouse. As we start the new year and the new decade, you may be making plans and setting goals for your future. Don’t forget to include your dog! Here are a few ideas for activities you could try together. You probably won’t have the time – or interest – to try all of them, but why not make a commitment to try one or two this year. Your dog will thank you for it! Your dog can learn new tricks almost no matter how old he or she is. Sure, older dogs may require more time and patience – and you may need to be a little less ambitious about what you try; but if you know what drives your dog, whether that be food, a favourite toy, or cuddles and attention, you can work on a new trick. If you’re stuck for ideas, try searching YouTube. Training your dog to “sit” or “drop” at home is one thing… doing it in front of a bunch of other people, dogs, and distractions – and being judged on it – is another challenge altogether! Developing your working relationship with your dog to this level will benefit both of you, and give you confidence that you can keep your dog safe under a wide range of conditions. Contact your local obedience club for details. Now this one definitely isn’t for everyone. But if your dog has “herding” ancestry, whether it be Border Collie or German Shepherd; or something a little more unusual like Hungarian Puli or Norwegian Elkhound, you might want to try your hand at herding ducks, geese, or sheep. 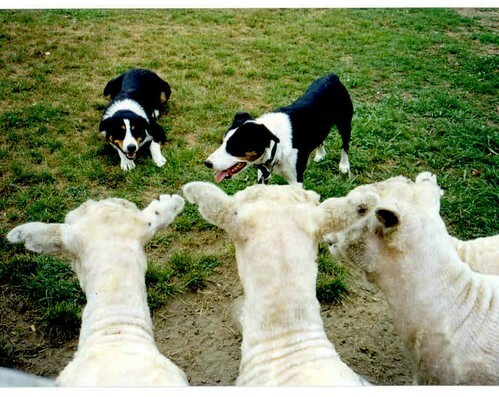 Herding is a fabulous way for your dog to exercise its instincts and breeding; not to mention a great way to hone your communication with your dog. For more info, you could do worse than starting at the Dogs Victoria Herding info page. If your dog is of the small, terrier-type or otherwise tunneling persuasion – for example a Jack Russell, Dachshund, or Border Terrier, here is a great way to test its instincts. Your dog must navigate its way through a series of man-made tunnels and find its quarry. Could also be handy if you have a rodent problem at home! More info at the Dogs Victoria Earthdog page. 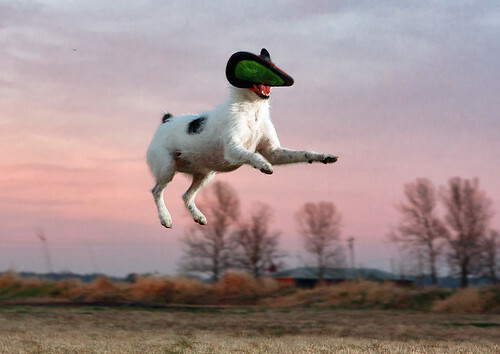 Sure, you might throw a frisbee for your dog occasionally at the park; but did you know that Canine Frisbee is actually a proper sport? That is to say, it has rules and a championship structure, and you can play it with other people and dogs? For more info check out Canine Disc Australia. You already know how much joy your own dog can bring you. When you’re not feeling the best, a few minutes with your dog often helps to take your mind off your problems. Well why not share the health benefits of your dog with others? Dogs have plenty of love to go around. After going through a training and accreditation process, you’ll be able to take your dog to places like nursing homes and watch the smiles he or she brings to the faces of the residents. Contact a therapy dog organization like Delta Society for more info. …Well hopefully at least one of those activities appeals to you, and you’ll give it a try this year. Let us know your thoughts in the comments below!